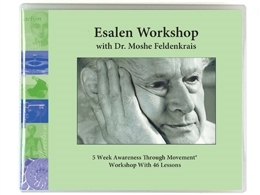 For years it was thought that no audio record remained of the Moshe Feldenkrais's important and beloved Esalen workshop. Generations of practitioners have delighted in the brilliance and scope of the Esalen lessons, available until recently only in written form. Now for the first time since 1972 (!) the audio recordings of this groundbreaking course are available for people to have and study at home. The Esalen workshop was an extended program taught to a small group of professionals with the intention of introducing the participants to the breadth and depth of the Feldenkrais Method and eventually forming them as teachers of the Feldenkrais group work, Awareness Through Movement. The participants included many of the leading people in the humanistic psychology movement, thus the atmosphere was lively and Moshe was highly engaged. The course took place over a five-week period and included 46 outstanding Awareness Through Movement lessons, each highly structured and suited for a 45 to 60 minute class. Note: These are "MP3 Audio CDs", so they may not play in older CD players. They will reliably play on your computer or an "Mp3/CD Player". They also work with most DVD players.